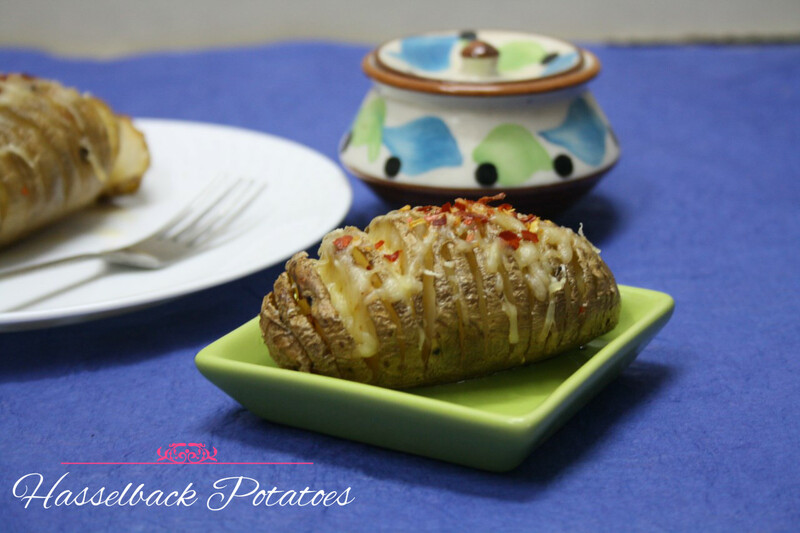 For the final day of cooking with 3 ingredients, I took the liberty of excluding the accepted ingredients like the salt and oil to make these delicious Cheese Hasselback Potatoes. 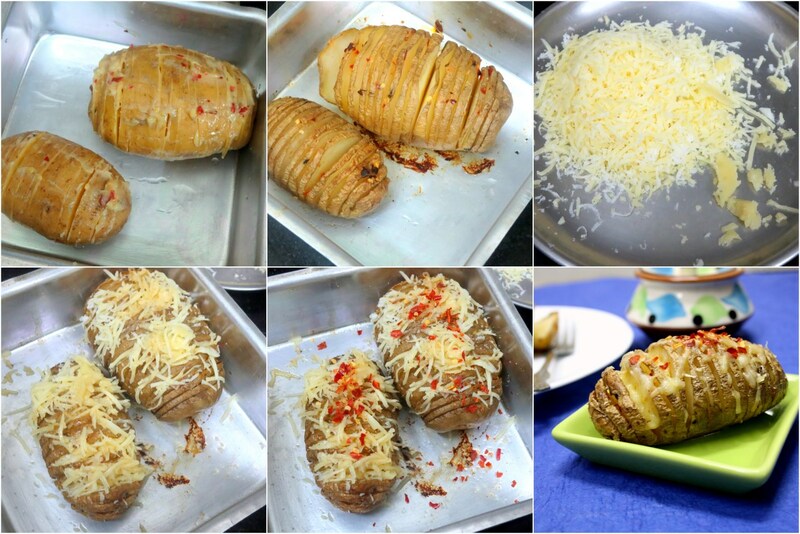 I could’ve very well made a plain Hasselback Potatoes without the cheese. Then I thought when I am going to indulge in making something with the potatoes, I might as well go all the way and make it cheesy. This was also made and served during a movie time, naturally I had to plan it ahead and it was getting baked to be served during the interval time. It took pretty long time for the baking to get done and I thought I could’ve microwaved the potatoe for a quick serve as well. Should do it next time. School started for the boys and we were pretty much running around trying to see if they got everything in their bags. As usual everybody remembered things to be done at the last moment. And we were thankful that things are normal..
Red chili flakes, salt and oil. 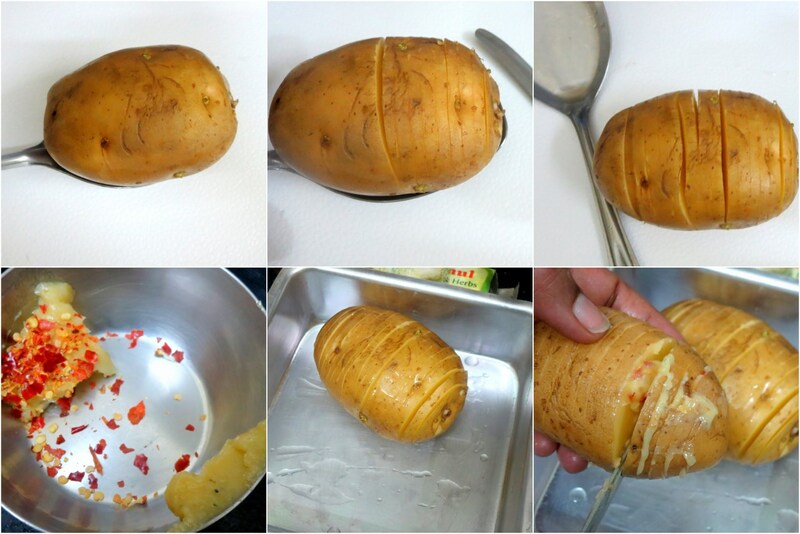 To get the correcto slices and not completely slice through, keep the scrubed potato over a dented ladle as shown in the picture and slice it through to think slices. Brush with garlic butter, sprinkle salt and red chili flakes. Pre heat the oven at 200 C and bake for 40 mins or till the potatoes are soft. Once done, sprinkle the grated cheese over it and bake for another 5 – 7 mins. I love these potatoes and adding cheese is so sinful! Wow they look super delicious. 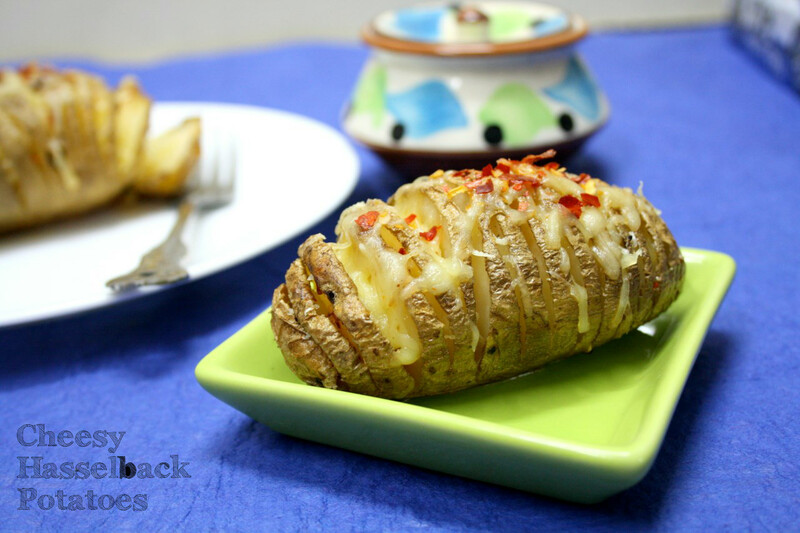 I love this potatoes very much, cant resist to this fabulous hasselback potatoes. Wow I love these potatoes. Wow they look delicious. Wow those potatoes looks so cheesy and tasty. Wow! these look very tempting. I totally forgot about baking these. My older one has been after me to bake these for a while now. these look beautiful and must have tasted delicious too! I agree , this is one addictive dish! !SO good right! These are in my to-do list since the April BM, looks totally yumm!!! This recipe is on my list for a long time. The skin looks so crispy! Perfectly baked. This is my to do list ever since I saw many make this during mega BM. Love the cheesy goodness along with the potatoes. Lovely snack Valli! 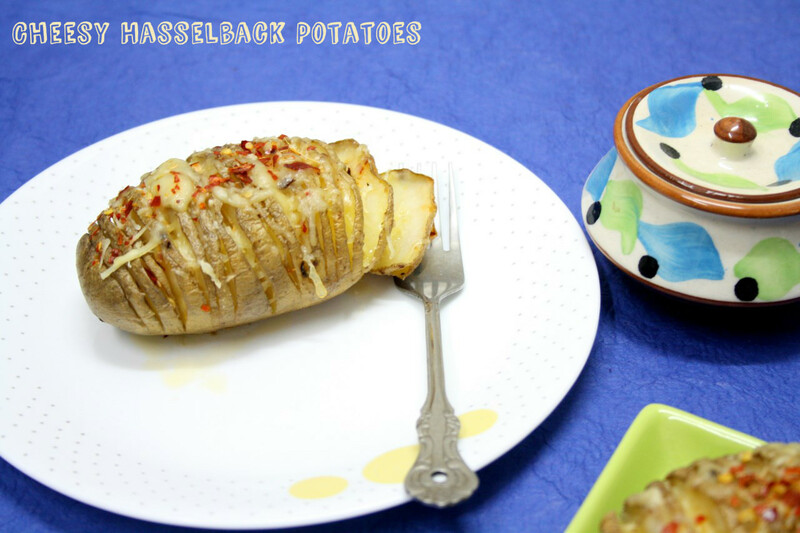 These hasselbeck potatoes are on my to-make list for a very long time. You are tempting me to try this dish real soon. Love the red pepper flakes sprinkled on top. Idlis with Wheat Rava / Bansi Rava Idli ~ Diabetes Diet Food! Parathas with leftover Potato Peas Kurma ~ Quick dish for kids!